Pisco was born during colonial times when the first Spanish settlers brought vines to Peru from Europe in the 16th century. Pisco is a brandy made by distilling the solid remains leftover after pressing the grapes (usually sub-standard) during wine production. This was first developed by the Spanish settlers as an alternative to orujo, a pomace brandy popular in northwest Spain. 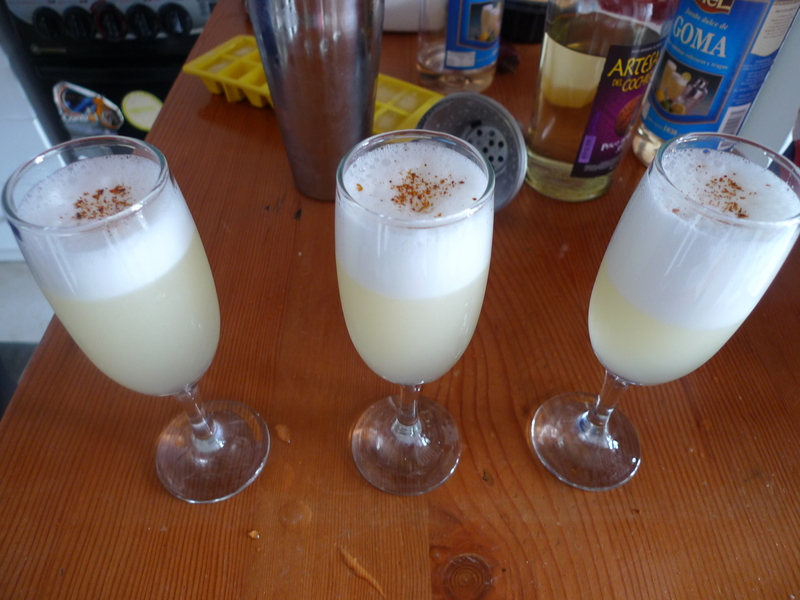 Fast forward a few centuries, the Pisco Sour was invented as a kind of Latin American version of the whiskey sour. The cocktail is made with pisco, lemon or lime juice, egg whites, simple syrup and bitters. At the end of the day, the national origin of the Pisco Sour seems a bit irrelevant considering how vastly different each country’s cocktails are. The type of grapes used differ, the parts of grapes actually distilled differ, the citrus fruits used differ (Chileans use lemon juice and Peruvians use limones verdes, or what we know as limes), and the ratios differ. However, I think both are quite delicious with their smooth citrus flavors and frothy caps. But beware, this cocktail is deceptively strong. 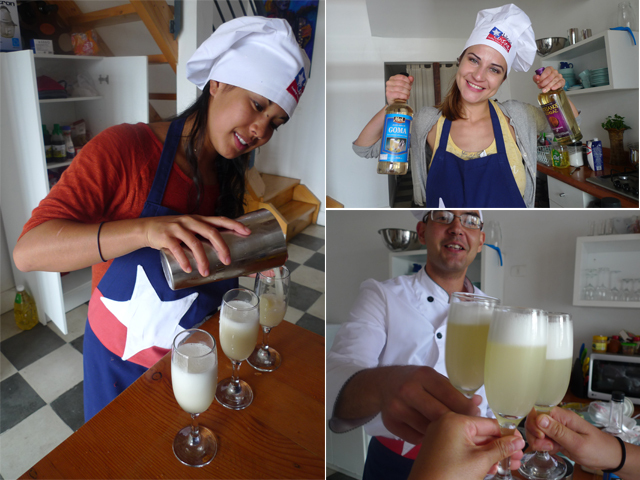 So here is the recipe for the Chilean Pisco Sours Natalya and I made during our Chilean Cuisine Cooking Class when we were in Valparaiso. For those in NYC, check out Panca for its Peruvian Pisco Sours and other delicious Pisco-centric cocktails. Add the pisco, lemon juice, syrup, ice cubes and the egg white to a cocktail shaker and shake vigorously until you can no longer hear the ice cubes. Dress the rim of the glass with egg white and powdered sugar. Strain into the chilled cocktail glasses and enjoy. 1) Replace the syrup with liquid honey (1 part) and add 2 pieces of green chiles finely chopped. 2) Use the traditional recipe and add 6 leaves of mint.